We provide an exclusive array of OTC Products to our valuable patrons. Under this range, we offer Medicated Chest Rub and Analgesic Gel. The entire range of products are formulated using high grade ingredients and advanced technology to ensure their flawlessness and perfect functioning. Owing to their superior quality and high performance, these products are highly acclaimed by the clients and are easily available in the market. Besides, patrons can avail this range as per their need. 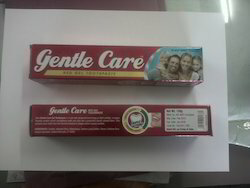 Gentle Care™ Red Gel Toothpaste is made with advanced technology to fight cavities, a unique fluoride system which strengthens teeth and acts like a protective barrier around them. This protects teeth from the harmful bacteria in plaque which causes cavities. Great Mint flavor freshens breath.